Italian industrial production fell for a third month in November, adding to signs that growth in Europe's fourth-biggest economy is slowing. 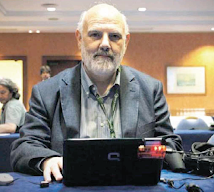 Production fell 0.9 percent from the previous month, when it dropped a revised 0.6 percent, the Rome-based national statistics institute, or Istat, said today. Economists expected an increase of 0.3 percent, according to the median of 25 forecasts in a survey by Bloomberg News. ``Everything is now pointing to a downturn,'' Maurizio Binelli, a senior economist at Abaxbank SpA. The economic outlook for Italy's economy is getting bleaker and bleaker at the moment as weak domestic demand and the impact of a stronger euro on exports put the ecoonomy in a pincer vice. The euro's 15 percent gain against the dollar in the past year is adding to Italy's competitiveness problems as oil prices at around $100 a barrel pushes up energy bills, raising production costs and leaving families with less money to spend. Production of consumer goods declined 0.3 percent from October, led by a 2.7 percent drop in the output of durable goods like refrigerators and washing machines. Output of non- durable goods gained 0.2 percent. 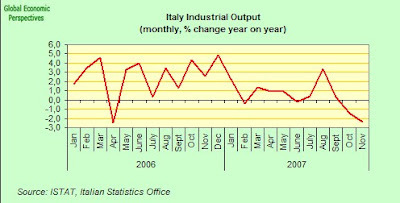 Italian business confidence declined to a two-year low in December, while a sub-index measuring manufacturers' expectations for production in the next three months fell to 11, the lowest since July 2005, according to the Rome-based ISAE report. 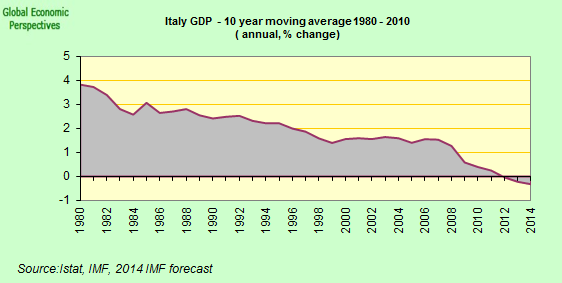 The OECD in December revised their 2007 Italian forecast down to 1.8%, and the 2008 one down to 1.3%. Confindustria also revised their forecast down in December, arguing that growth would slow to 1 percent in 2008 from an 1.8 percent this year, citing factors like the rising cost of food and oil and the rise of the euro against the dollar. Such numbers are clearly not encouraging, but arguably downside risk for 2008 is greater even than either the OECD or the Confindustria forecasts reflect Morgan Stanley's Vladimir Pillona is somewhat more sanguine. While presenting the MS central forceast for Italian economic growth to slow to 1.0%Y in 2008, from 1.8%Y in 2007, he goes on to note that "even annual GDP growth of 0.5%Y next year has a significant possibility of occurring, as shown by our model’s forecast error bands". I personally will be very surprised if we still see calendar year 2007 anything like as high as 1.8%, but more to the point even 1.3% may be rather on the high side if we get a significant deterioration in the external environment, especially in Eastern Europe on which Italy is fairly dependent, and where the Italian banking sector has significant exposure. So that puts me much nearer to Pillona's "basement bargain" number of 0.5% than to any of the others. One of the reasons for my pessimism relates to my assessment of Italy's current trend growth rate, and to the level of fiscal and monetary tightening which may be operating on the economy even as it slows. During 2007 the Italian govenment has been running a fiscal deficit of comfortably below the 3% of GDP required by the EU commission. But since this fortunate situation was in part acheieved by the use of one off measures, and in part by the strong tax inflow from the above trend growth, the government will need to maintain a comparatively tight fiscal stance to keep things on course, and any attempt to further loosen may run into real problems with the EU commission and the credit rating agencies. And as I keep arguing, it is very hard to see an accomodative monetary posture from the ECB in the near future.